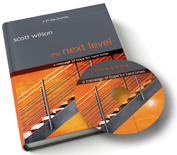 The Next Level is a campaign we are starting at CIL based on Scott Wilson‘s book! We’ll take a look at men and women of the Bible to see how they faced challenges and tests of all kinds. In some cases they trusted God and passed with flying colors, but some failed miserably. All of these stories teach us important lessons about how to face the difficulties of our lives and move to “The Next Level”. We are asking you to do 3 things that will help you reach The Next Level. 1. Attend each Sunday to hear messages on The Next Level. 2. Join a 242 Group for the “summer schedule” that starts the weekend of May 1-2. 3. Purchase and read The Next Level book by Scott Wilson. Starting May 9, we will read through this book in 31 easy, daily readings during the campaign. I will be posting my thoughts on the readings on this blog, as I read thought the book with you. If you buy the book at CIL, each hard-back book cost $15. Buy one for yourself, and another for a friend who is going through a hard time. If you don’t come to CIL, but still want to go on this journey with us, you can purchase a book by clicking here. We don’t start until May 9th, so if you order in the next few days your book will get to you by the 9th. Let’s go to the next level together! Pastor David gave a great sermon on evangelism on Sunday. If you didn’t hear it, click here to listen to it on itunes. David reminded us that the typical person needs seven gospel presentations before they’re ready to give their life to Christ. Our prayers were answered in that we encountered several (approximately 6 or 7) people who were not saved. None of these people received Jesus but were obviously moved by the Holy Spirit as we preached the Gospel to them. A few others were saved but were given clarity on how and why they were saved. We also prayed for a couple of people – a ninety-year-old lady for more strength and vitality and a middle aged man who had heart issues and was on a heart transplant list. In summary, good seed was planted and watered. We are grateful to the people who prayed for us in the church. . . the best news was from a team member that reported that a 12 years old boy she shared the good news with prayed to receive Jesus. All the angels in heaven are rejoicing. Please keep (this young man) in your prayers for a TRUE relationship with Jesus and much growth in Him. After a year and half of reading assigned books for my Master’s program and sermon preparation, I finally was able to read books by choice while on vacation this week. 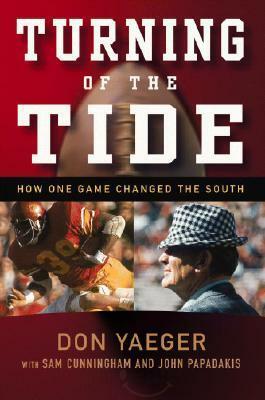 One of the books read was Turning of the Tide: How One Game Changed the South by Don Yeager. When USC played Alabama in Birmingham in 197o, the Crimson Tide still only had white players. The Trojans were integrated on their roster, and they dominated the football game. Yeager proposes that this game was a key turning point for change in attitudes and practices in integration across the Deep South. This was an important book to read, though it did get redundant. As someone who loves college football, I find this book as an important snap shot on what the game was like forty years ago. It’s amazing to me who much has changed since 1970 in society as a whole. Sports can play an important role in being a mirror on what is happening in the larger society. On Monday I visited the Bill Clinton Presidential Library in Little Rock. It was an enjoyable and nostalgic experience. I was humbled to remember the Nineties. We were much more innocent then, not fully understanding the depth of hate the Islamic fundamentalist have for America. Thanks to the internet boom, we also had a growing economy that we thought would grow forever. Some sensible economic principles in our government and personal lives would have better prepared us for the last three years. Despite his character flaws, it is still amazing that a son of a single Mom in Arkansas could educate himself, enter politics and become the president. To me, Bill Clinton is the quintessential Baby Boomer – so much talent, so many ideals and so many disappointing moments. I am glad to see his humanitarian efforts in these years after his presidency. If you have no interest in the Assemblies of God, feel free to skip this entry. While District Council had some positive aspects, there were some major issues that emerged during the business meetings last week. I was part of a group of pastors who proposed legislation at District Council in the attempt to change some dynamics in our district. These changes were voted down handily. This reminded me of Jesus’ parables of the patch and the wineskin (Mark 2:21-23). I am not stating that the new is good, and the old is bad (or vice versa). The point of these parables are clear – old paradigms and new paradigms are not compatible. At the Tennessee District Council it became clear that two groups of ministers have two different paradigms, and they are not compatible. Each group had deep conviction that they were in the right, and there was very little to compromise on. #1 Organizations must change or die. #2 Not all changes are good. So take your pick. I can respect those who differ with me because they disagree with specific changes. However, to make no changes is naïve and irresponsible. Our movement is in negative decline, so there must be some kind of change or the inevitable will occur. Just got home from the Tennessee Assemblies of God District Council in Murfreesboro, TN. Superintendent JR Gould and his team put together an outstanding line-up of speakers that featured Dave Ramsey, RT Kendall, Ed Stetzer and John Lindell. I think this line up reflects a huge desire in the District leadership to be relevant and inspire churches to grow. This event has come a long way in the last thirteen years I have attended. I hated missing the service tonight at CIL – I actually got very sad around 6:15. However, I had the huge honor of introducing John Lindell before he spoke tonight. I had never met Pastor John before tonight, but I have admired his church and ministry for years. He was a very kind and humble man. I always leave District Council with respect for my fellow pastors’ and their families who are leading congregations in Tennessee. They are a group of faithful people, who love God and their churches. Growing up I loved Good Friday because it was another day off of school. I was supposed to be reflective on Christ’s sacrifice that day, but I was just thrilled to watch Leave it to Beaver and Gomer Pyle on syndication. Each year I age, the depth of the cross sinks deeper in my heart. The events of Friday started at midnight, as Jesus was accused throughout the night. Being falsely accused is so exhausting. Add to this the mocking and torture techniques, and its just overwhelming. By mid-day on Friday, it was simply an absurd scene of a group mob. Giving into animalistic instincts, people were actually enjoying the misery of this gentle man. I think I will reflect on the death of Jesus the rest of my life, and discover new things constantly, yet never fully comprehend it. This morning I went through the “Stations of the Cross” by myself at our church. I am carrying in my pocket right now a small cross that I picked up at Station #9 that reminds me that I am not living for Aaron anymore, but I have died and been resurrected with Christ. His pain and suffering, for my sin. I’ll be reconciling this truth with my heart the rest of my life. I look forward to reflecting on this more with you at tonight’s Good Friday service. We will sing, remember, take communion and thank Him. I hope to see you tonight at 7:00 p.m.